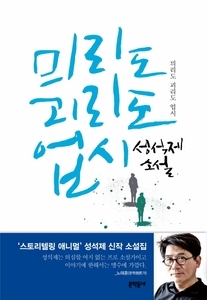 Sung Suk-jae�s novel collection. It is a collection of eight short stories written from 2013 to 2016. Exactly 20 years after the debut of his first novel, Suk-jae is releasing this new book under the title �믜리도 괴리도 업시� (Meereedoh Gwehreedoh Ubshee). This is a shortened phrase for the saying �미워할 이도 사랑할 이도 없이� (Meewuhhal Eedoh Saranghal Eedoh Ubshee) which can be translated as �No means to hate and no means to love.� From a friend (and his blonde homosexual partner) who suddenly reenters the protagonist�s mundane life to a young reader who is in search of a single book that can explain the meaning of life to a man hangs himself on a tree because he cannot prove that he is no longer a spy, this novel is full of characters whom we can neither shed tears for nor laugh for joy for.